Mourne Training Services: "I'm a trainer? But that's not in my job description. Is it?" "I'm a trainer? But that's not in my job description. Is it?" If you work in a science laboratory environment then you probably are. In most working environments it is normal practice for an experienced member of staff to show new and less experienced staff how to perform common work related tasks. This practice is very suited to a laboratory setting due to the large range of tasks that need to be learned by a new starter. These include learning about: the range of procedures to be followed; the ways of working; the operation and calibration of equipment and instrumentation; computer software applications used in the laboratory, etc. Sometimes this type of training is provided within a formal framework, where individuals are assigned to maintain and train others on a specific piece of equipment or analytical technique, but sometimes it is simply a case of “will you show John how to use the Karl Fischer?” An initial training session may be followed up with support for the learner as they gain competence in the task in question. On-the-job training has clear advantages for the laboratory if it is well implemented; it is cost effective, flexible, and the learner is doing the job while they learn. It is also good for the learner; they are trained by someone with a good working knowledge of the task and implementation of the learning is usually possible immediately. But what about the trainer? Is training others a welcome and enjoyable responsibility, or an unenviable extra duty to try to fit into a busy work schedule? This depends on how the individual feels about being a trainer. Some people enjoy it more than others and some find the whole concept very daunting . Acting as a trainer in the workplace has a number of benefits, the most important being that of improving your career prospects. The ability to train others is a valuable addition to your CV, particularly important in the current economic climate. Delivering training in a particular area hones your own skills and knowledge in that area since explaining it to others requires full understanding on your part. This maximises your assets and can lead to recognition of your expertise, an important consideration in promotion prospects. The interaction with the staff members that you train can increase your exposure in the workplace and thus enhance your reputation and standing. Additionally, the skills involved in training can be used in a managerial role. If these advantages do not appeal then there may be another incentive to get involved in training. It is likely that a responsibility for providing training is written into your job description, particularly if you have one of the fairly broad, generic job descriptions much favoured in recent years. Of course the benefits listed above only apply when the training being delivered is successful and effective. One of the problems when using in-house staff as trainers is that the quality of the training can be variable and the individuals involved are not always given guidance on how to plan and deliver training. The purpose of this series of articles is to provide advice and tips on the best way to approach a training event. The word ‘event’ is used here to signify any training programme, large or small, which needs to be implemented in your laboratory. 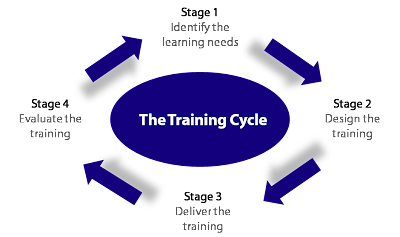 Next time we will look at each of these stages in more detail to give you an overview of what you need to do to implement your training event.